ENVIRONMENTAL IMPACT Produced by David J. Wagner, L.L.C. David Wagner’s exhibition “Environmental Impact” represents a new level of broad yet focused appreciation for the sheer power, promise, and impact of art on the wisdom and sensibilities of current environmental crises. And crises they are. The myriad of artists, media and subject matter encompassed in the exhibition combine to convey a remarkable testimony to the urgency, persuasiveness and abundance of insights, perspectives, and power of art. “Environmental Impact” is packed not with empty mantras to a better state of being for the planet and all that dwell therein, or a blind and grasping homage to the beauty of life itself, but with deeply personal statements that range from lyrical epiphanies to thoroughgoing activist expressionism; from figurative paroxysm to surreal data–crunching. 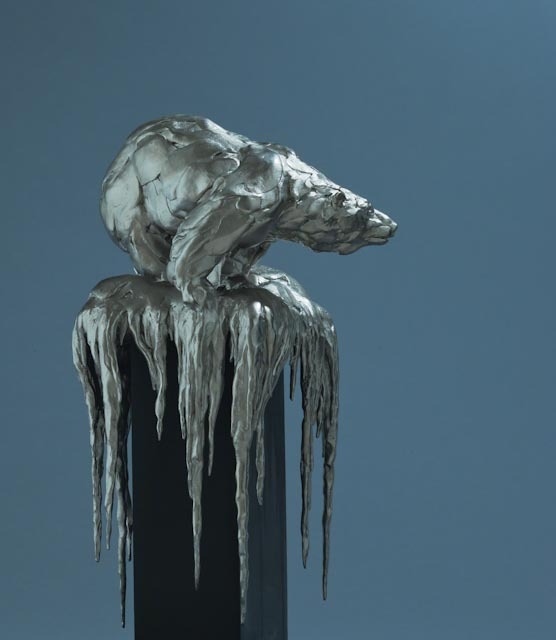 Viewers of “Environmental Impact” will experience the beauty, the turmoil, the levels of ambiguity and mixed message, but may also feel unexpected pangs of hope, even pragmatic responses to environmental concern and outright disaster. 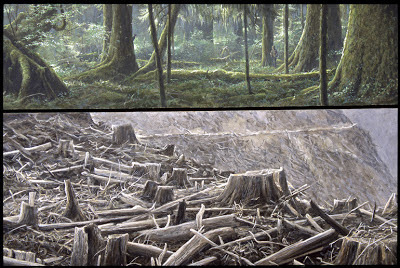 Take one clear example, that serves as a fitting emblem for the exhibition: the lead painting, by famed Canadian artist Robert Bateman, entitled “Carmanah Contrast”. The Carmanah Walbran Provincial Park in British Columbia has been much celebrated for its huge Sitka Spruce, one of which is over a thousand years old and 314 feet high, amid a misty coast range of temperate rain–forest like luxuriance. This park was created as recently as 1990, following outpourings of protests by locals over clear–cutting that had been occurring in the area for years. Bateman’s painting shows both sides of the story: the Creation, and human desecration. In similar veins, Pieter Breugel showed, in his “Dark Day” and “Hunters in the Snow” (both painted in 1565) barren wintry trees populated by ravens, hunters and their dogs stalking game below, stormy peaks, frozen congeries of the human presence, suggesting a tenebrous looming angst symptomatic of our species’ presence in all directions. But at least the trees remained standing. Breugel was likely unaware of the vast stretches of forests that had already been cleared throughout most of England, and Europe’s lowlands, from Portugal to what is, today, Belarus. Breugel, in his own manner, was an activist, focusing upon human despair and disruption on so many levels. Whereas his eldest son, the “Velvet Breugel” preferred to concentrate on magnificent renditions of paradise, Adam and Eve, of Noah’s Ark and perfect flower arrangements. It was this latter nostalgic evocation of Arcadia’s Golden Age that won over most artists of landscape throughout time. That tradition goes back as far as documented art itself: to the earliest known records of Paleolithic aesthetic sensibility at places like Lascaux and La grotte Cauvet Pont d’Arc, discovered in 1994, with over 400 animal depictions; or the 5,000+ cave images recently found at 11 sites throughout northeastern Mexico near Ciudad Victoria; to Mesolithic images of animal life in regions where the rain curtain would subsequently shift, exposing stark yet revealing petroglyphs in desert canyons that joined with later Egyptian and Greco–Roman frescoes to suggest an incipient grasp of the power of nature over human consciousness. This power – humanity’s need and capacity, that is, to celebrate and revere nature —may well be the very key to humanity’s survival, if not the biosolutions to the endowment and pertinacity of the rest of those species and populations that cohabit the planet with us. There are no formulas for how the aesthetic conscience is likely to operate, let alone perform miracles. The outcomes of any seemingly ideological contests are a case–by–case experiment in human behavior and perception. Across the multitude of the nearly 11,000 currently known bird species, their beauty in our eyes (and in their own eyes, as beholders of one another – as can scientifically be surmised – has coincided with a mixed record, to be sure, of survival and extinctions, most usually at our hands. The history of ornithological art – one of the greatest of natural history aesthetic media – originated in a frenzy of Latin–driven science based orientations, deriving from Aristotelian biology and culminating in such mammoth approaches to depicting the natural world as displayed by the great Buffon, Audubon, John Gould and J. G. Keulemans. It was this latter, prolific artist who supplied both Walter Lawry Buller (1838–1906) and Lord Walter Rothschild (1868–1937) magnificent paintings for their respective books on the Birds of New Zealand (1873) and Extinct Birds (1907) ushering in an era – in keeping with the transcendentalist calls for preservation by John Muir, President Abraham Lincoln, Ralph Waldo Emerson, Henry David Thoreau and President Theodore Roosevelt. Roosevelt took the art and activism of John Muir to heart, embracing Muir’s unity of character, passion for writing, for fantastic metaphor, and re–invented America’s future, knowing that the paintings of a Bierstadt, the chromolithographs of a Moran, and the photographs of a Watkins must translate into more than mere imagination: these were real places demanding real action, if future generations were to have an opportunity to see what the Earth truly was. Roosevelt, like the artists he admired – including photographer Edward Curtis, whose 20–volume Indians of North America, with its 2200 remarkable images – reimagined a future for all of us, at a time when Curtis, and George Catlin before him, recognized the signs of “a vanishing race” and, like Audubon with the Passenger Pigeon, realized that, indeed, people, cultures and civilizations could go extinct just like birds, should we fail to act in time to save them. Sometimes the stakes were different than the protection of a big grove of trees in Mariposa, or a Yosemite Valley or Grand Canyon. Sometimes, it could be a pure and simple as a cow, painted by French artist Rosa Bonheur (1822–1899); or a coming storm as figured in so many works by the brilliant Scottish/American Luminist George Inness (1825–1894) who saw the juxtapositions of sublime nature and the onrush of modernity across the horizon. Such technically assured empathy as that displayed throughout much of the Hudson River School, for example, on behalf of multi–tiered sentience all around us would come to dominate the emerging environmental rallying cries of the 20th and 21st centuries. It was Inness, borrowing from a precedent in Thomas Cole (the forest stumps in many of his paintings) who frequently placed a clear and active smokestack within an otherwise perfectly tranquil natural scene. This is most disturbingly clear in Inness’ “The Lackawanna Valley” (c.1856) in The National Gallery in Washington D.C.
By 1923, the very love and admiration of artists spawned overpopulation by tourists in the Yosemite valley, air pollution, the obfuscation of indigenous populations (the Southern Miwok, for example), and other blights, while a million automobiles entered Yosemite National Park to the tune of a park superintendent declaring that Americans should be able to visit this nation's legally enshrined ecosystems in this standard to which they were accustomed (namely, in automobiles). This mob of adulation accounted for the carving of an automobile–sized hole through a giant redwood, an iconic (even celebrated statement at the time) of the conflict of the public’s love of nature, and the sad truth of the democratization of Eden. By the late 1940s, sensitivity to natural scenery had been clearly revolutionized: National Geographic’s pictorial spread of the North Cascades’ sublimity, after a similar depiction of Yellowstone many decades before by nineteenth–century painter, Thomas Moran, would result in runaway public fanfare and a storm of the earliest so–called eco–tourism and picture postcards by photographers most notably, Edward Muybridge, as to force the hand of Congress in their determination to protect over–crowded sites of world–heritage class stature. Whether over–crowding can be stopped in a world destined to add billions of more consumers hungry for wilderness remains one of the most troubling and unanswerable of conundrums for the artist and naturalist. 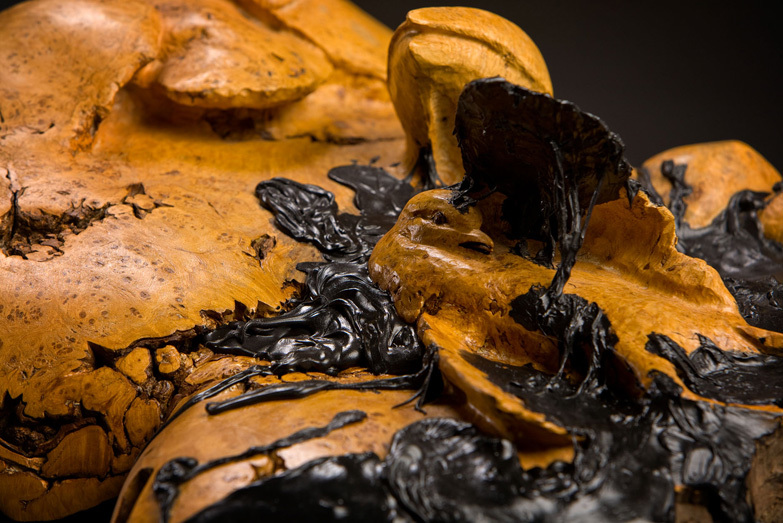 From New Mexico to Israel, Wagner has sought out works of art that lend credence to the all too–real truth of environmental despoliation occurring worldwide at this point in time. Ironies cascade, memories cry out to be forgotten, others recalled by way of vivid and disturbing testimony. In each work of art there is a quintessential nerve ending gone awry that beckons for remedy, re-attunement, some other emotion beyond mere sorrow and loss. 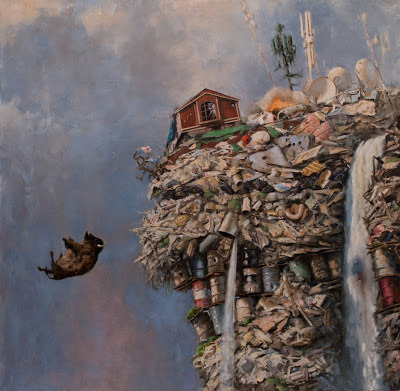 These artworks are populated by tragedy, or the symbol of such: Life receding into mute dumps, silent pits, poisoned cavernous wilds that deny wilderness in favor of human depravity. There are dead birds, desiccated horizons, ruined rivers, an escalation of toxic layers that mimic all that art better left to our nightmares. Yet, by nature of the assemblage and its theme, these artists and their creations have given us melancholy to think about and be moved by. Such is the chaos that enshrouds human contradiction, in setting after setting. This collaborative topography leaves no stone unturned in its ruthless laying bare of what it is, from quadrant to quadrant, neighborhood to neighborhood, that humankind is wreaking on the Earth in the name of occupation. Fake hay, homes abandoned, lives lost. There are fumes, unchecked hideous developments, broken–down dreams, oil spills, death and despair: all this, in the name of human evolution beside the fantasies gone haywire of some perverse paradise that once was and, by all accounts, will never be again. If this seems too harsh a commentary, the amalgamation of precisely articulated curatorial particulars makes it clear that this is no exaggerated desperation but the world of our own doing. If we are so desperate, why, then, do we continue to add insult to injury? From polar bears and dolphins to frogs, homes built on prime agricultural land, to the “Apocalypse” itself – this exhibition is unique. What do “Rising Tides” and Reno, Nevada have in common? Vancouver Island or a shrimp farm (formerly a mangrove) in Vietnam? These relationships are rendered sobering and unambiguous through the very humanity implicated in “Environmental Impact.” A pile of tires takes on the entire universe, as does a holding pond. The images in numerous media are, collectively, the heartbreaking truth – done beautifully, provocatively, barren, rich, resplendent, depressing, horrifying – all of the above and more. It is a terrifying prospect, taken together, of the human presence on earth. In the juxtaposition of Walter Ferguson’s little girl building sand castles beside a half–sunken tire in “Save the Sea Shore,” and Lucia deLeiris’ intoxicating image of Antarctica’s “Ross Sea,” are admixed the two most troubling of all intimations: a little girl’s daydream, untroubled, perfect, intoxicating, and a distant nuance from the end of the world, as we now have come to recognize the signs – cracks in the ice, a melting continent, global warming, and the utter dismantling of a planet where life has evolved over the course of 4 billion+ years. Antarctica’s ice is nine miles deep, atop rock. But that is all changing, now. Not the rock, but the veritable pH of the Southern Antarctic Ocean convergence waters which, in turn, fuel the food chain essential for phytoplankton, krill and the entire marine mammal and seabird ecosystems of the Southern Hemisphere. The late explorer Thor Heyerdahl first detected DDT in the fatty tissues of penguins as early as 1968. Rachel Carson helped change all that, but so have the artists. 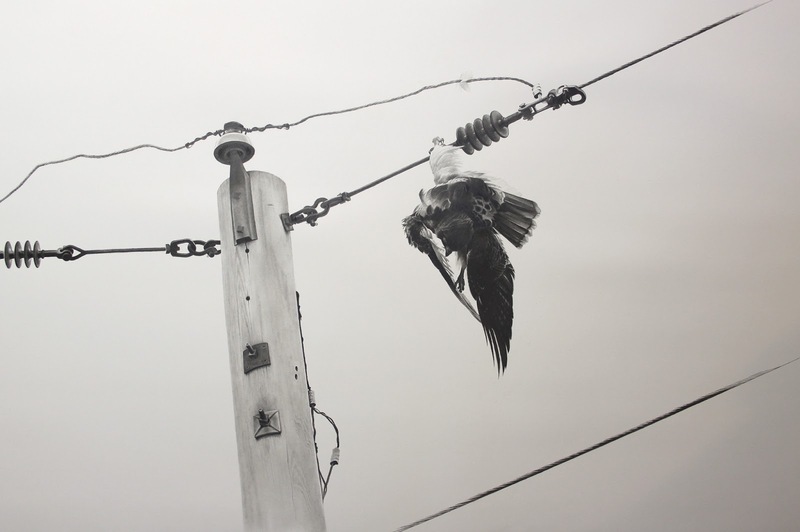 From smokestacks to garbage dumps to birds with nowhere to migrate, “Environmental Impact” tells a story teeming with collaborative efforts by painters and scientists alike; a chronicle of woes at the beginning of the 21st century. These are not mere “inconvenient truths” but shattering realities. Scott Greene’s “Oasis,” a recent oil on canvas, in some ways says it all: dead lambs on a seeming altar that has taken the great Jan Van Eyck’s Ghent Altarpiece (“Adoration of the Mystic Lamb”1430–1432) and transmogrified it into the human story, a sacrificial lamb whose silent repose, in death, betrays all of the innocence lost; the beauty that belies the truth of our biospheric mortality. This is no accident, but the forensic evidence, sealed in artistic nuances of great insight, that we have created; a monster by our own undoing. Yet, paradoxically and without forgiveness, we are also a combined force of a witness, a species clearly in tune with its own hemorrhaging powers and the sensibility and coherence of thought to know we are in trouble and something must be done to correct a mistaken course. 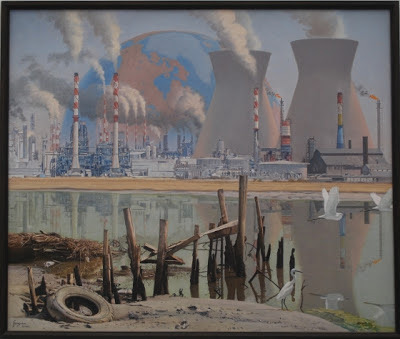 As we approach 9, 10 possibly 11 or 12 billion Homo sapiens, our reckless indifference to an ungainly foothold tells a story that Wagner has carefully laid out with 75 brilliant works of contemporary art and commentary on the current ecological crisis. This was not an easy task of fitting pastoral parts together; or combining the best of a certain theme – horses, women sowing, men in court, even smokestacks. Indeed, there has rarely if ever been such an exhibition wherein the madness of civilization has been so forcefully and elegantly told; such beauty and rich intelligence brought to bear on so much ill–boding imagery; and so colossal and enduring a menace as that represented by ourselves, in so beautiful a choreography. It is as if beauty has been harnessed to foretell the end, not unlike those wondrous engines of doom pictured by Gustave Doré in his illustrations of Dante’s Inferno, or of Don Quixote smacked silly by a windmill. We are on the ground, here; near death. This exhibition – which could not have been easy to assemble – is a harrowing wake–up call and one that cannot, must not be ignored. If a “wildfire” in the Sacramento Delta, a landslide, freakish genetic engineering or the critically endangered Siberian Tiger, whose numbers are statistically approaching zero, are not enough to shake us from our complacent rut, then nothing will. Herein is the art of our age told unsparingly, without rhyme or metrical calm. It is jarring and depressing to the extreme, even as we inevitably marvel at the sheer beauty that humans can make out of misery; the glory inherent in our own destruction, and that of others who cohabit the precious Earth. How is it we can pull this off, one must ponder? How can so much beauty be instinct within the decay and acid rain, gill nets and harpoons that herein are all too recognizable? Eco–psychologists ponder the strange bedeviling that is our psyche and our out–of–control ego; the greed, callous indifference and outright cruelty of which we are, in part, capable. Capable translates into culpable, and “Environmental Impact” makes it clear and palpable that there are no happy zoos; that Jaguars are losing ground and smelters demolishing our children’s hope of clean air to breathe. What then? What new art form is likely to arise that can redeem us in the face of a generation that could, if left unchecked, be remembered not for art, or destruction for arts’ sake, but for utter and unremitting desolation. Should that be the case, then this exhibition will be remembered as an all too fitting epitaph. One comes away from this assemblage of fine art with a single hope: a flame of conscience that strangely, whimsically, soulfully wishes for something other than that which is before us. Let us take these measures of the human soul, these reflections on the passing of a generation, to heart: and resolve with all the incandescent and the subtle threads that have been woven together in this exhibition so as to resurrect some other conclusion: the safety, tranquility, and assuredness of a future for our kind, and by our kind – for all of life on Earth. That is a new kind: a kindness of which we are made, as we are of drawing a bird, a tree, or regarding with hope and with awe and wonder the sunrise and the sunset. If the history of landscape art has come to naught, then “Environmental Impact” is indeed a fitting tribute to a terrible end. But, as we would prefer to perceive it, this exhibition is a cautionary tale, done in finery and diversity, and just in time. It tells us with great intelligence, and splendor of what we remains to be accomplished: not more stupid mischief and ecological unraveling, but the active remembrance of things past, and of the possibilities for a new tomorrow. With an estimated 100 million species still sharing the planet with our kind (if one includes invertebrates and the myriads of bacterial and viral species invisible to the naked eye), there is every reason to be hopeful. To believe that we can succeed. The intelligence and prolific talent enshrined in “Environmental Impact” makes it abundantly clear that we have what it takes to survive, and to do so with nobility, virtue and generosity. Picasso’s “Guernica” reflected the horror of the Spanish Civil War, just as four–hundred years of Christian iconography mirrored all that was violent and religious in nature throughout the Renaissance. The countless Christs on the Cross, or the arrow–ridden Saint Sebastian were indicative of a dualism instinct in human nature. Yet, at the same time, those very impulses to depict tragedy were at the core of great art and sociological realism. If ecology is the global religion of the 21st century, then that same Christ–figure, as perceived by so many richly diverse artists, is the Earth herself. “Environmental Impact” is no less indicative of seriously troubled times, and possibilities for the dawn. An important development in American art history emerged a decade after mid-twentieth century: the painting of fish observed by divers capable of taking photographs underwater. Credit for this development belongs to Stanley Meltzoff (1917-2006). Meltzoff was born in Harlem the son of a cantor at a synagogue in Manhattan. Like his contemporary, Roger Tory Peterson (1908-1996) (who is best known as the father of the field guide), Meltzoff attended the Art Students League. After Meltzoff graduated from City College in 1937 and earned a Masters of Fine Arts degree from New York University, he taught art and art history at City College for two years, and then served as a World War II artist-journalist and art editor with Stars and Stripes magazine from 1941 to 1945 in Africa and Italy. [i] After the war, Meltzoff painted magazine ads and returned to teach City College of New York. From 1950 to 1955, he taught at Pratt Institute, but he gradually abandoned teaching to paint full time. My wife was ill, my children needed college money, and I was almost 60 years old. I stood on the corner of 56th St. and Lexington Avenue [New York City] in the rain with a soggy portfolio in my hands and improvised a sad little song about defeat, flat feet and [being] flat broke while I tried to think of something to do. A picture maker for reproduction, such as an illustrator, depends on the media available. What would Norman Rockwell have accomplished without four-color printing in pass periodicals? The media for which I had learned to work had dissolved and I had to refashion my skills. Meltzoff began this new episode in his career, and in the history of American wildlife art, by painting striped bass around 1964 which Sports Illustrated published in 1966. 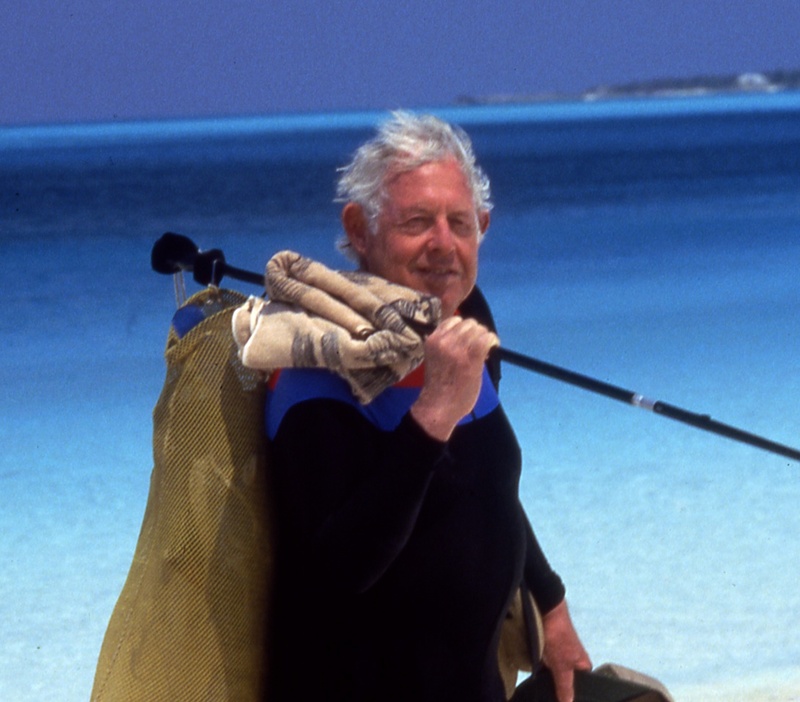 “His advantage with stripers was being an avid spear fisherman. He knew striper physiology and behavior from countless hours spent floating in the water with his prey, trying to think like a Striper.”[v] Meltzoff’s method was to take photos underwater to project onto board, and then draw and paint in his studio. Meltzoff would play around with the composition and design in pencil, often embellishing and combining his photographs, and then painting in the finished drawing last. 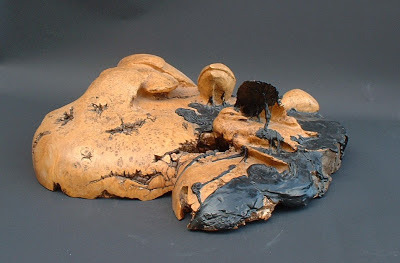 Meltzoff achieved an exceptional degree of anatomical and ecology accuracy through this method, which he pushed through creative license for unusual perspective and drama. He went on to paint some 26 striped bass in the 1960’s. The only bill fish he never photographed or saw diving was the elusive spear fish. During these years, Meltzoff also dove in Nova Scotia and the Straits of Florida to observe and paint blue fin tuna. Through a family connection in Canada, he spent time swimming among tuna inside farms off Prince Edward Island. 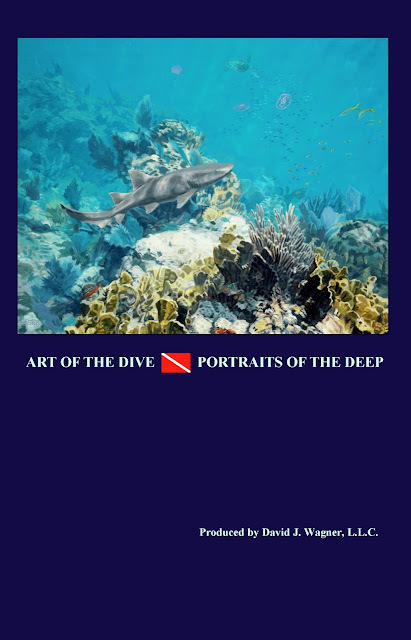 In Florida, as well as the Virgin Island and Belize, he also painted jewfish, turtles, dolphin and sharks. The tradition that Meltzoff began in 1960 was taken up by a younger generation of enthusiastic and talented artists during the last quarter of the twentieth century, as he noted in his manuscript: “I had become a fishpainter, at first the only fishpainter, but others soon followed and now there are more than thirty flapping in the school.”[ix] Perhaps the greatest evidence of his influence has been the Annual Exhibitions of the Society of Animal Artists (which he actively served as a member of its Board of Directors and a member of its Membership and Exhibition Juries in the new Millennium before his death), and which perennially displayed art of the dive by the next generation of wildlife artists after it was introduced by Meltzoff . [i] Stanley Meltzoff, “Stanley Meltzoff, Metamorphoses of a Picture Maker,” Illustration, no. 4 (August, 2002), p. 39. [ii] Email message from Diane Pogrant (Mrs. Stanley Meltzoff), May 12, 2007. [iii] Dennis Hevesi, "Stanley Meltzoff, 89, Avid Diver Who Painted Marine Life," New York Times, November 15, 2006. [iv] Meltzoff, "Metamorphoses of a Picture Make," p. 33. [v] Email message from Diane Pogrant (Mrs. Stanley Meltzoff), May 12, 2007. [vi] Stanley Meltzoff, Illusions of a Fish Painter (unpublished manuscript). [viii] Meltzoff, Illusions of a Fish Painter. Mike Rivken and Stanley Meltzoff, with Foreword by Sir Ernst Gombrich, Stanley Meltzoff – Picture Maker. La Jolla, CA: Silverfish Press, 2010. NOTE: The unpublished manuscript referred to in Wagner's 2008 book, American Wildlife Art, appears in its entirety in Rivkin's 2010 book, Stanley Meltzoff – Picture Maker.